Unfortunately, moss growth on the roof of your home or business is inevitable in BC. It thrives on hard surfaces, in a shady climate, where the environment is moist and/or humid. Sure, you could rip out every overhanging tree on your property; but there’s no way to stop the rain from falling or high winds from blowing debris onto your roof from elsewhere. 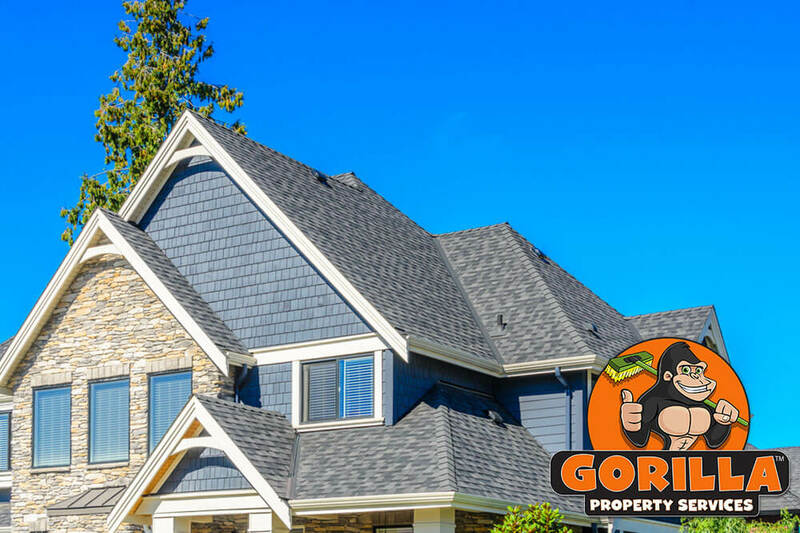 A much easier option to consider would be Gorilla Property Services Penticton Roof Cleaning and Moss Removal. On arrival at your home or business, safety is our technician’s primary objective. Gorilla Property Services is a proud member of WORKSAFE BC. Therefore, safety equipment maintenance is performed after installation but prior to commencing any project. Our Gorilla will perform a full walk around of your property to ensure all tie-offs and safety harnesses are in place and fully secured before accessing the roofline. Once the Penticton Roof Cleaning and Moss Removal service is complete, the difference in aesthetics alone is undeniable. Your property will look so much more appealing which is a huge factor if you are considering putting your home on the market. In fact, this service is one of the first a home inspector will recommend. Even if your roof is older, a little TLC can delay the need to repair or replace it. Perhaps your home or business is equipped with asphalt shingles. In cases such as this moss can grow and thicken to the point of lifting the shingles, allowing water to access and rot the wood underneath. Our Penticton Roof Cleaning and Moss Removal Service follows the ARMA (Asphalt Roofing Manufacturers Association) protocols and procedures to ensure you get the full life expectancy from your roof.